A star political reporter at the New York Times has been suspended over allegations of sexual misconduct involving younger, female journalists. In a statement, a spokesperson for the Times called the allegations against Glenn Thrush, one of the newspaper's top reporters covering the Trump administration, "very concerning and not in keeping with the standards and values of The New York Times." "We intend to fully investigate and while we do, Glenn will be suspended," the spokesperson said. "We support his decision to enter a substance abuse program. In the meantime, we will not be commenting further." A story published Monday by the policy and politics website Vox.com said that Thrush, 50, has "a history of bad judgment around young women journalists." The story included allegations from three women, as well as the article's author Laura McGann, who together accused Thrush of "a range of similar experiences" that included unwanted groping and kissing and "hazy sexual encounters that played out under the influence of alcohol." Thrush joined the Times late last year after a successful eight-year run at Politico. Since joining the paper, he has teamed up with fellow Times reporter Maggie Haberman, herself a former Politico writer, to deliver some of the biggest stories about President Trump's White House. The two interviewed Trump earlier this year, and they landed a deal to write a book about the president. 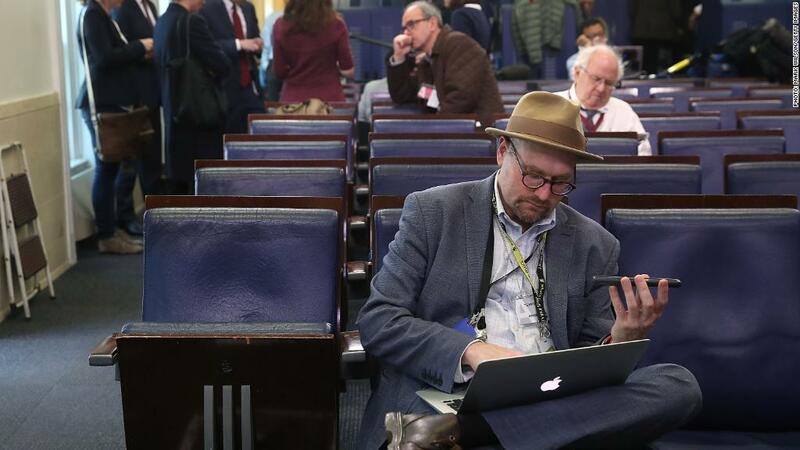 Thrush's longtime Beltway chronicling has made him a fixture on cable news over the years, but his coverage of the Trump White House has elevated him to new heights. Last year, "Saturday Night Live" depicted him in multiple sketches. And earlier this year, Thrush signed a deal with MSNBC to become a contributor there. A spokesperson for MSNBC said Monday that the network is awaiting the outcome of the Times' investigation into Thrush, and that he "currently has no scheduled appearances" on the network. Theresa Zoro, a spokeswoman for Random House, which is slated to publish the book by Thrush and Haberman, told CNN, "This matter recently came to our attention and we are looking at it closely and seriously." In an email to staff on Monday, Times executive editor Dean Baquet called the allegations against Thrush "troubling." "The alleged behavior described in the [Vox] piece is clearly not in keeping with the values we expect from Times employees," Baquet wrote. "We plan a thorough investigation and while it is ongoing, Glenn will be placed on suspension." Later in the day, Times CEO Mark Thompson sent out his own email, in which he urged employees to approach managers or human resources with any concerns about sexual misconduct. "As Dean says, we're committed to ensuring that we treat every allegation of sexual harassment with utmost seriousness," Thompson wrote. "I apologize to any woman who felt uncomfortable in my presence, and for any situation where I behaved inappropriately. Any behavior that makes a woman feel disrespected or uncomfortable is unacceptable. "My recollection of my interactions with Laura differs greatly from hers -- the encounter was consensual, brief, and ended by me. She was an editor above me at the time and I did not disparage her to colleagues at POLITICO as she claims. The assertion that I would rate women based on their appearance is also false. "I have never offered mentorship or reporting advice to anyone, man or woman, with an expectation of anything in return. To assert otherwise is false. "The June incident related in the story was a life-changing event. The woman involved was upset by my actions and for that I am deeply sorry. "Over the past several years, I have responded to a succession of personal and health crises by drinking heavily. During that period, I have done things that I am ashamed of, actions that have brought great hurt to my family and friends. "I have not taken a drink since June 15, 2017, have resumed counseling and will soon begin out-patient treatment for alcoholism. I am working hard to repair the damage I have done." Politico CEO Patrick Steel addressed the Vox story in an email to staff on Monday, calling the allegations against Thrush "serious and disturbing." "The notion that anyone at POLITICO would be subjected to harassment—or feel as though they couldn't speak out—is totally unacceptable to me," Steel said. "Our standards and values leave no ambiguity—this behavior will not be tolerated, period."